As a Virtual Assistant Practice owner, I’m almost always plugged into technology, always looking for the newest online thing, always connected and available in some form or another. I’m very lucky in that every year, my husband and I go to a friends’ cottage in the remote Quebec countryside for a week of peace and quiet. Not totally removed from civilization however, as mobile phones can be used by standing at the end of the boat dock, and depending on the service provider, you might get a call through. There’s no dedicated satellite or Internet service up there, no daily newspaper delivery. Totally my kind of vacation! I spend the entire week reading, knitting and writing. 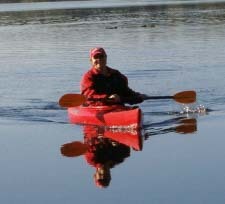 I love to kayak on the lake most mornings when the water is still. It’s very peaceful and lets me just think about things without all that day to day noise in my head. Some might say that I’m downright lazy during my week off. Is that okay? Yes, it certainly is because I deserve it. Do I miss technology when I’m at the lake? No because I don’t need it there. I have come back from the cottage for the last 7 years and everything is okay: the world is still spinning, my city house is still standing. To me, it’s all about that elusive thing called “work-life balance”. This phrase is becoming, in my view, an anomaly. Why? Because work life and personal life are becoming more easily blended into one entity and quite frankly, I think we as a society are having trouble setting boundaries because of it. Finding a perfect “balance” is also elusive – it shifts and changes depending on our needs, interests, work time, play time, family, friends and so on. Do you unplug at all? It not, why not? The world won’t stop spinning because you didn’t do a Social Media post this morning. With Virtual Assistance becoming more and more mainstream, why not find someone to check your voice mail and email or do those posts for you? There are new online applications coming out all the time that can make your life easier with remote management. You know you can unplug. What’s holding you back? Please share by posting a comment. Thanks!